Unreal Lawns supply and install artificial grass in Burnley and the north west of England. We serve domestic and commercial customers in the area, with products suitable for a wide range of applications from outdoor spaces and gardens, to event areas, exhibition space and more. See below for some examples of projects we've carried out in the Burnley area. Unreal Lawns were called by a customer in Burnley who had decided they wanted a garden that required less maintenance and hassle. The existing garden was a nice space, but the owners were growing tired of mowing and keeping on top of the lawn’s upkeep. We installed our Luxury 35mm artificial grass to replace the existing lawn, and created a raised flower bed using old railway sleepers, which we think goes perfectly with the artificial grass. The end result is a lovely space for the customer to relax and spend time with their grandchildren. 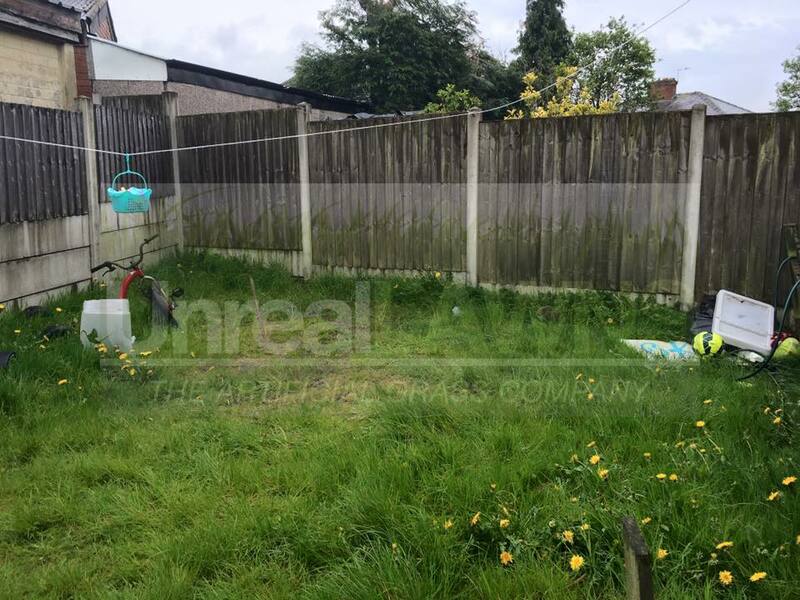 We visited this customer in Burnley to help transform their worn and tired looking rear garden into a more pleasant and usable space. As you can see from the photos, the garden needed quite a bit of work. Unreal Lawns relished the challenge and set to work installing our top of the range Supreme 38mm artificial grass. In addition, we fitted an Indian stone path, which contrasts nicely with the lawn. The finished result is quite a transformation we’re sure you’ll agree. The customer was certainly delighted with the work. 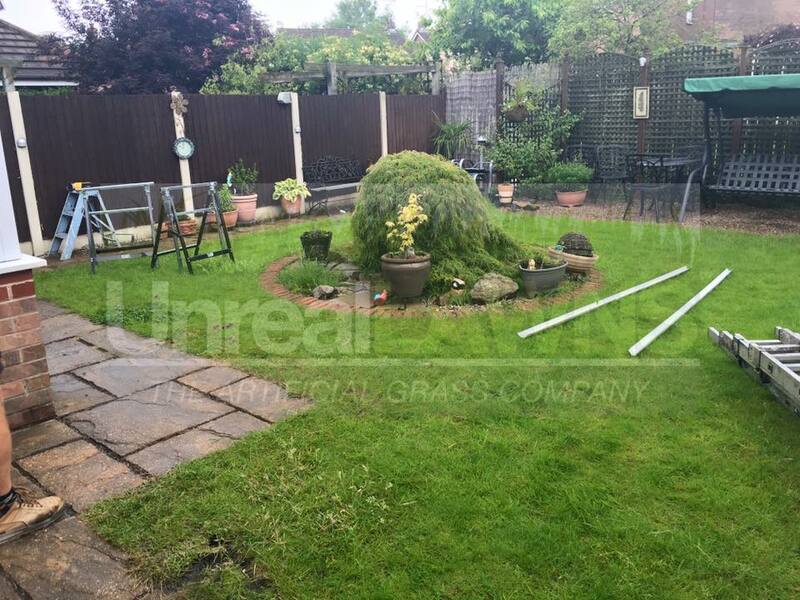 Unreal Lawns were contacted by a customer in Burnley who wanted to replace their boggy lawn with artificial grass. 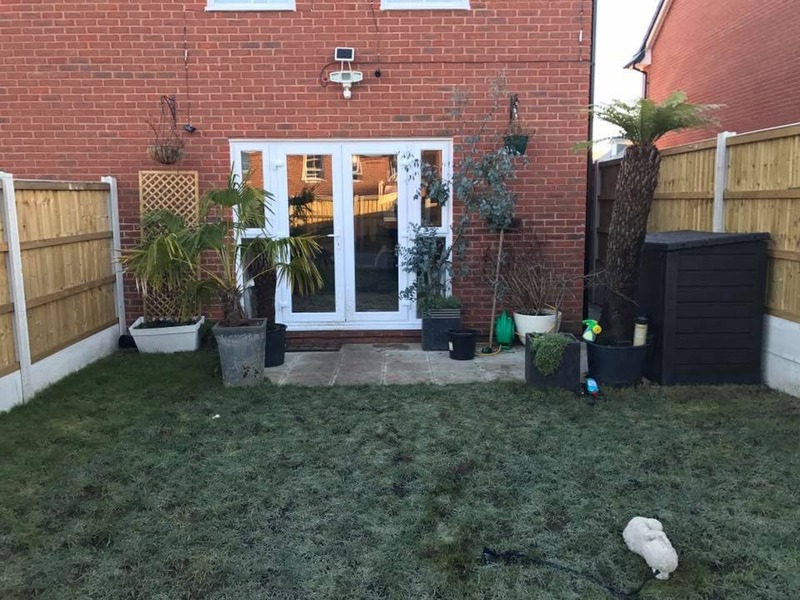 The previous lawn had become very patchy and boggy and was proving a nightmare for the homeowners. We installed our Supreme 40mm artificial grass to replace it, and created a new larger patio with Indian stone. The two create a great contrast. The installation makes the garden look much neater and more inviting to spend time in. The customer was over the moon with the work and happy to have a usable lawn again.